Not many are aware of the plentiful food options available at Orchard Central. 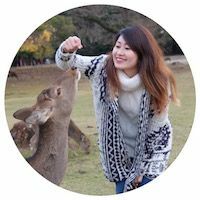 I was one of those unknowing until I embarked on a food trail recently within the shopping mall. Initially, I thought there were only a couple of F&B establishments on the verandah. However, I was surprised to discover a huge array of cuisines being offered from its basement to the rooftop. I visited a few establishments that I thought were unique, interesting and definitely worth a try: Joie by DOZO, Shi Li Fang 食立方 and YiLi PaoPao Ice. If you’ve dined at either Tao’s or DOZO, you would know that those restaurants offered a unique dining experience with many pleasant culinary surprises. At Joie by DOZO, you can expect the unexpected again. Joie is owned by the amicable Mr. Huang Yen Kun, the mastermind of Tao’s and DOZO. Joie, which means joy in French, is indicative of the feeling one gets when dining at Joie by DOZO. Joie by DOZO is a vegetarian restaurant that aims to redefine fine dining in Singapore using the freshest vegetables, fruits and herbs. Most people get unsettled at the thought of eating vegetarian. Despite that, I can say that vegetarian food when cooked well tastes equally as awesome as non-vegetarian dishes. It also leaves a healthy, refreshing, satisfying feeling as you finish your meal. Joie by DOZO is one of such places, which serves amazing vegetarian fare with a Euro-Asian twist. 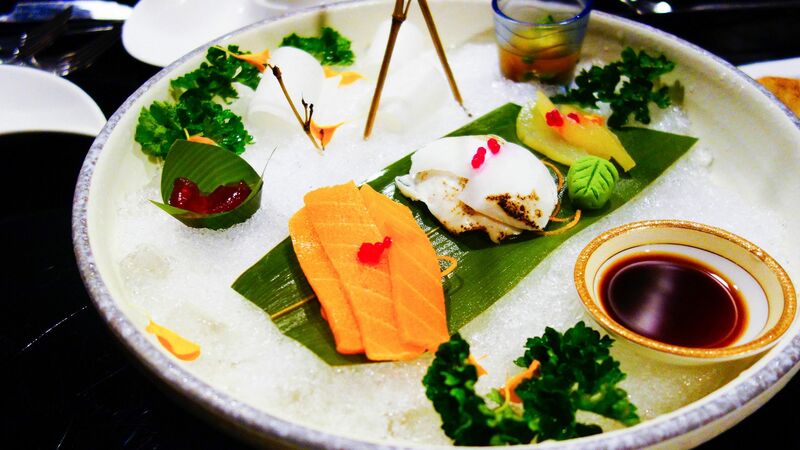 Joie by DOZO offers a lunch menu, which consists of six courses for $38.80++. The courses include a starter, side dish, soup, main, dessert and potion (unique beverage). The dinner menu of seven courses is priced at $68.80++, which consists of the six aforementioned courses and an additional cold dish. My meal began with an interesting looking platter. Firstly, I was told to try the sashimi in the middle. It did taste like chilled salmon but I found out it was actually carrot. (WHUT?) That is the beauty of vegetarian dining, the dishes’ looks may be beautifully deceiving, the techniques used may be complex but the taste is equally or even more wonderful. 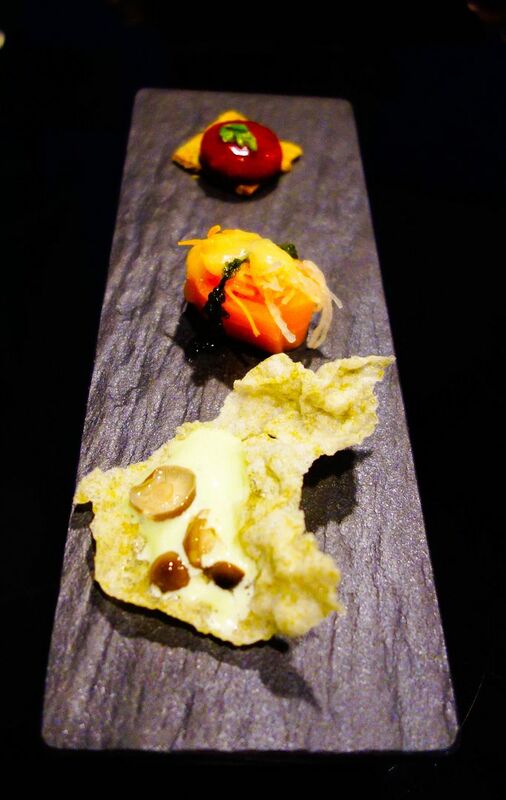 Thereafter, I had the cracker with wasabi foam on the right which was downright simple, but extremely delectable. Lastly, I finished the first course with a raspberry sphere laid on a pistachio wafer, which literally exploded in my mouth in a good way. 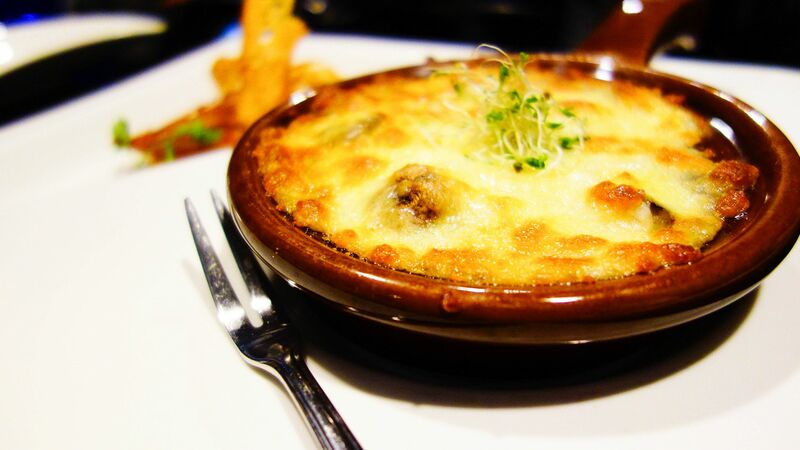 At first glance, this dish resembles escargots au gratin as it is served with an escargot fork. It is in fact, champignon mushrooms disguised as escargots. The button mushrooms mimic the same chewy texture you would expect from snails. It is served with focaccia bread and Belgian endive on the side, which helps balance the cheese with a subtle tanginess. 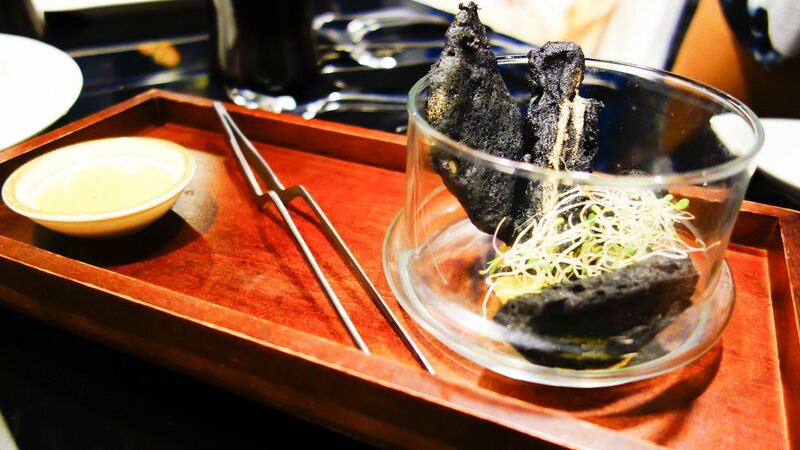 The assortment of tempura includes yam, apple, eggplant and banana is coated in charcoal. 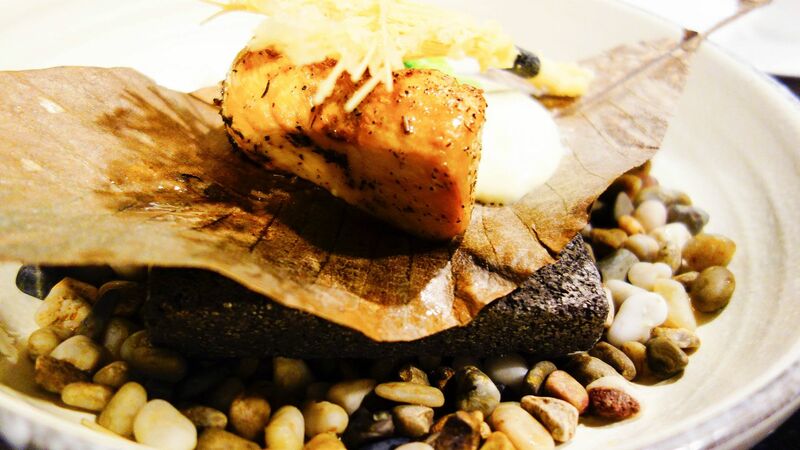 The charcoal does not only make this dish look extra unique, but it also has detox properties. This course doesn’t look like it can get any healthier. 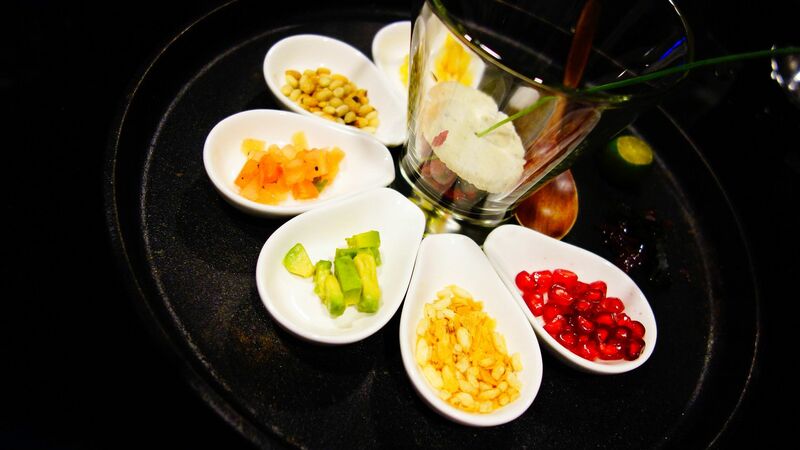 It is a platter of pine nuts, seaweed, avocado, corn, tomato salsa, pomegranate, seagrapes and rice puff. I put each component into the conical glass and tossed it together with a squeeze of lime juice to make a salad or healthy kacang puteh. 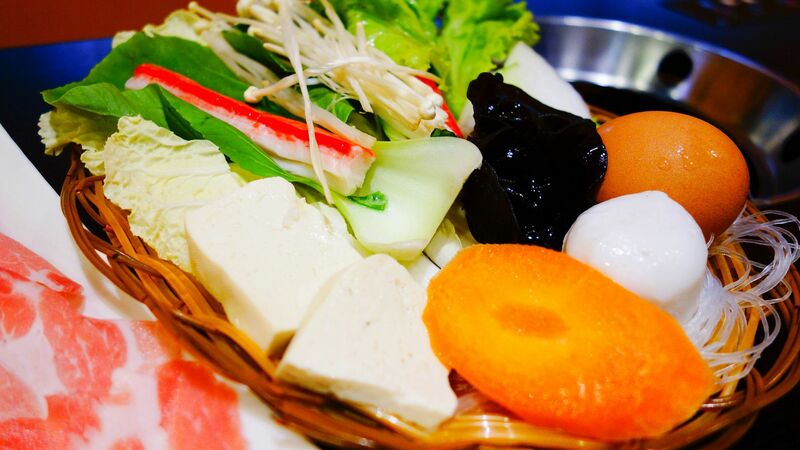 Another mind-boggling dish is the vegetable sashimi. It appears to be salmon, maybe sea bream and herring but once again, nope! Matter of fact is they are coconut, konjac, aloe vera and pear sashimi. 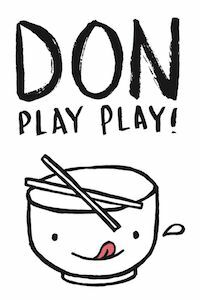 It is served with a dollop of wasabi and a saucer of light soya sauce, which really makes it seem legit! 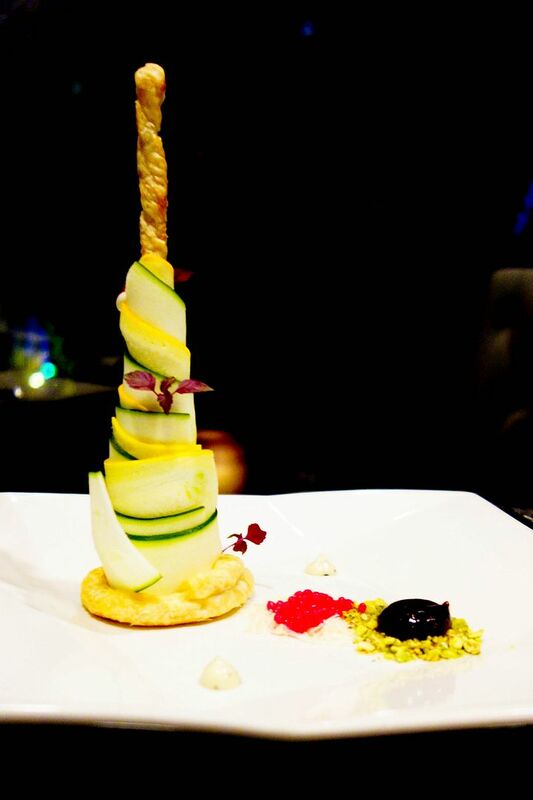 The zucchini tower is a spectacle to look at. After a few minutes of trying to get a perfect shot for Instagram, you just wonder how to eat this thing. Once disassembled, you can see every element, long wide shavings of zucchini with a crème cheese spread, gobbets of truffle mayo on top of the puff pastry with a flavoursome beetroot sphere. 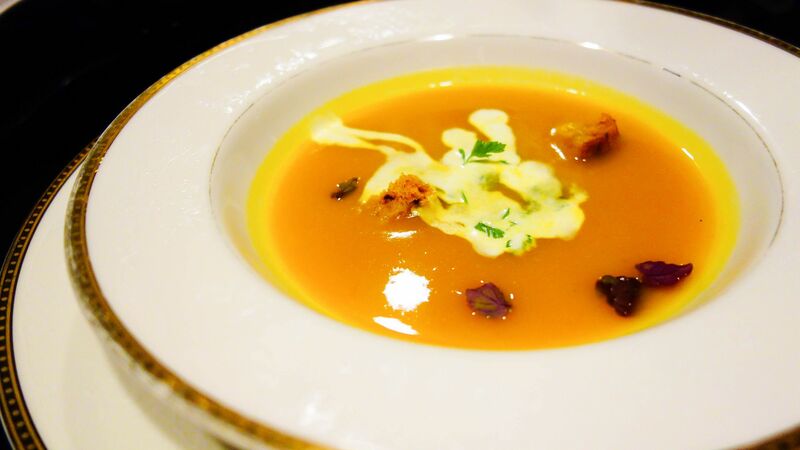 The pumpkin soup is my favourite soup in the menu. 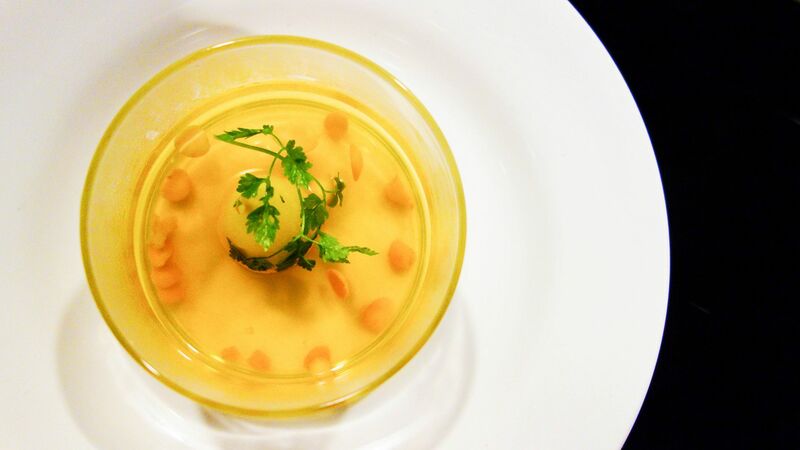 It is a velouté, which is usually prepared with butter and cream that results in a thicker and creamier soup. There are added tomato ciabatta croutons for texture and edible flower petals for fragrance. 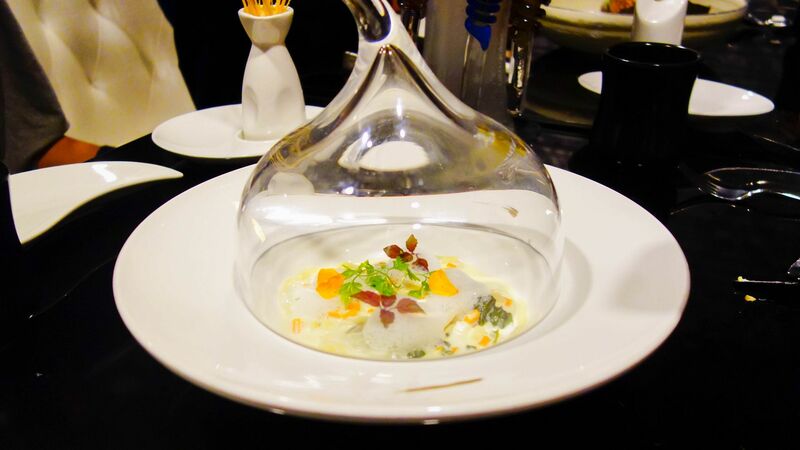 This pretty dish of pear and cabbage consommé was clear and soothing, like a sophisticated Chinese tea. However, it was chilled so the fragrance and flavour felt suppressed. 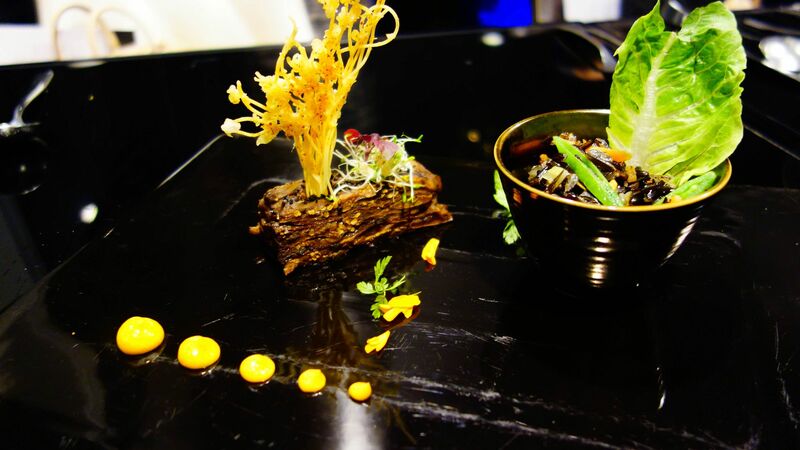 It was truly a spectacle to witness the grilled bai-ling mushroom steak, a Joie by DOZO’s signature dish, being served. 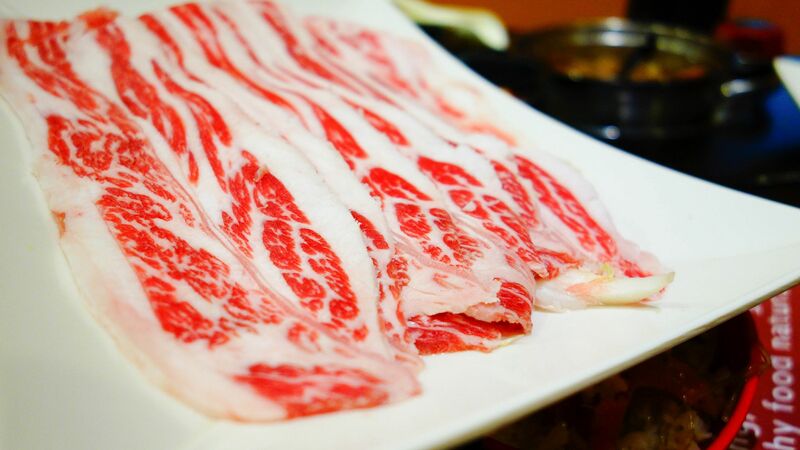 The sizzle from the 300-degree Celsius heated stone and the permeating aromas that come from the peppery marinate just stimulate one’s senses. This dish emits similar vibes to DOZO’s infamous grilled beef tenderloin. Unfortunately, this mushroom steak is no beef tenderloin as it lacked rich flavours less the pepper. Thankfully, the truffle dip was able to significantly enhance the mushroom steak. The eggplant terrine is supposed to emulate a type of French meatloaf. It also comes a with a serving of sautéed wild rice with baby radish, pine nuts, baby carrots and green beans. 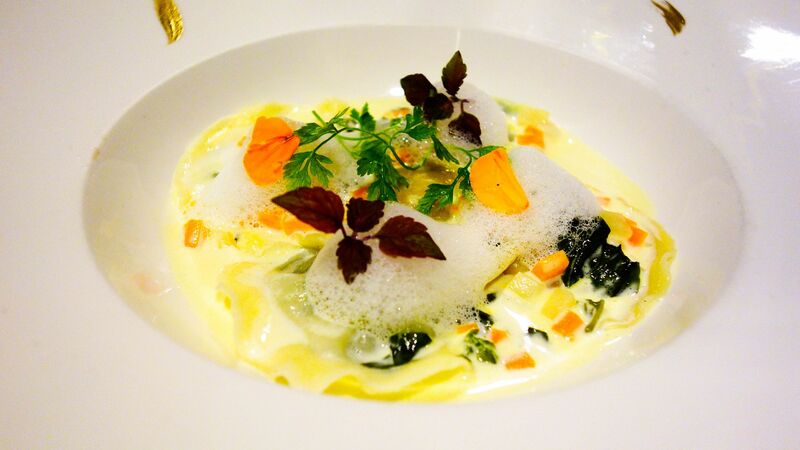 My favourite main is the pumpkin and spinach ravioli doused in a basil cream sauce and topped with a flower emulsion. Each ravioli parcel was stuffed with either a pumpkin or spinach filling and was packed with flavour. The pasta dough was uniformly thin, which made the tasting experience very pleasant. For a creamy pasta dish, this felt light on my stomach, which was great. 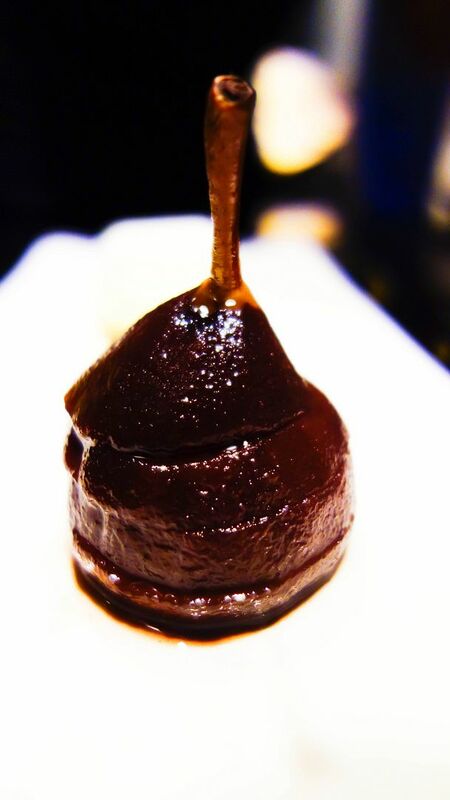 For dessert, I couldn’t resist having a bite of the red wine poached pear. The poached pear was spot on in terms of flavour, being sweet from the red wine but not too heavily seasoned with spices. However, the texture was just a tad too hard from perfection. All in all, in terms of taste, there was nothing to rave about but what were outstanding were the techniques used to extract those flavours from vegetables. I thoroughly enjoyed my experience at Joie by Dozo, from the spectacular service to the sensational presentation and sheer effort and creativity put in for each dish. If my friends or family wanted to try a unique dining experience or a great vegetarian restaurant, I’d definitely recommend Joie by DOZO. 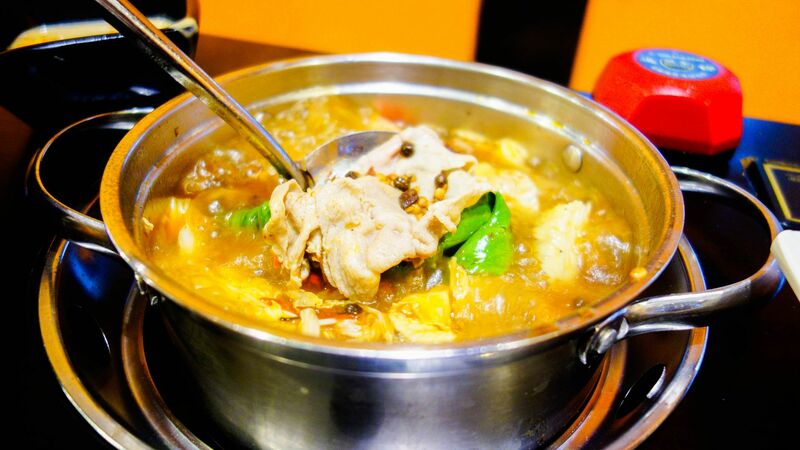 Shi Li Fang is a Taiwanese steamboat restaurant located on the 7th floor of Orchard Central. Each time I walked by Shi Li Fang (and I passed it many times as I dine frequently at OC), the restaurant was always packed! So finally, I managed to try this place and hopefully, I would find out what the hype is all about. 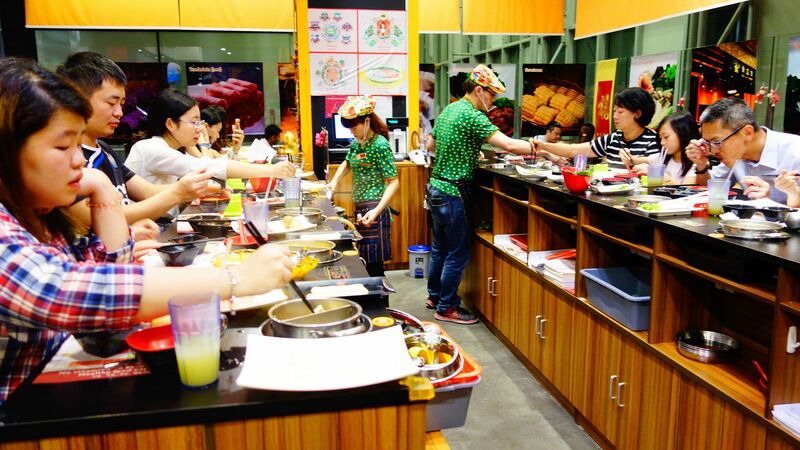 Shi Li Fang says it is committed to offer all natural, healthy and sustainable ingredients with no added MSG and does not serve deep-fried, pan-fried and stir-fried dishes. Inside, there are rows of countertops, each seat with their own stove for your own steamboat. This could be a good idea as you can have your own preferred food and avoid the things you don’t like. (E.g. if you can’t take beef so you can have your own beef-free pot instead of a shared mixed pot.) As you can see from the picture, the patrons are seated adjacent to each other, which isn’t ideal if you wanted to have a lovely chitchat or catch up. Also, there a few tables in the restaurant that can seat groups but these are usually snapped up quickly. You’d be lucky if you could get one during mealtimes. First, I had to choose my soup base from a decent variety of soups such as specialty mala, nourishing fish, chicken tonic and so on. There is an option to have two or three different soups for one pot but additional charges apply. Most customers usually order a set (choice of protein, vegetable platter and a choice of handmade noodles, rice, vermicelli, or egg noodles) then add à la carte portions if needed. Their sets go for $12 - $17 depending on the protein. The vegetable platter consisted of an impressive selection of ingredients. 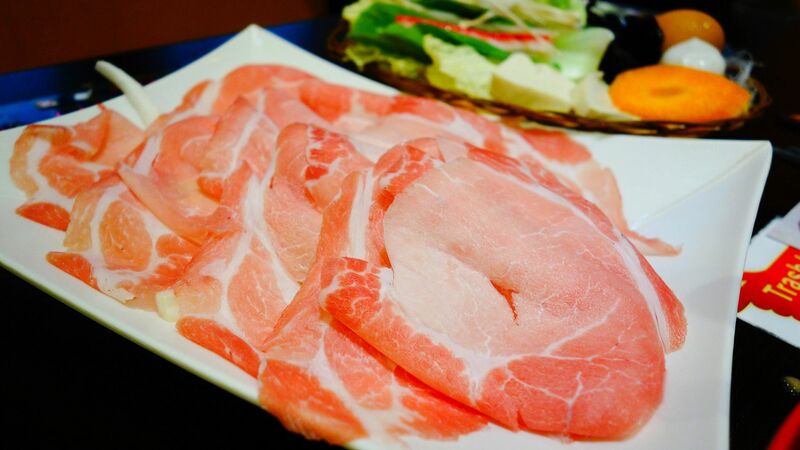 The marbled pork was intricately sliced for faster cooking and easier chewing. 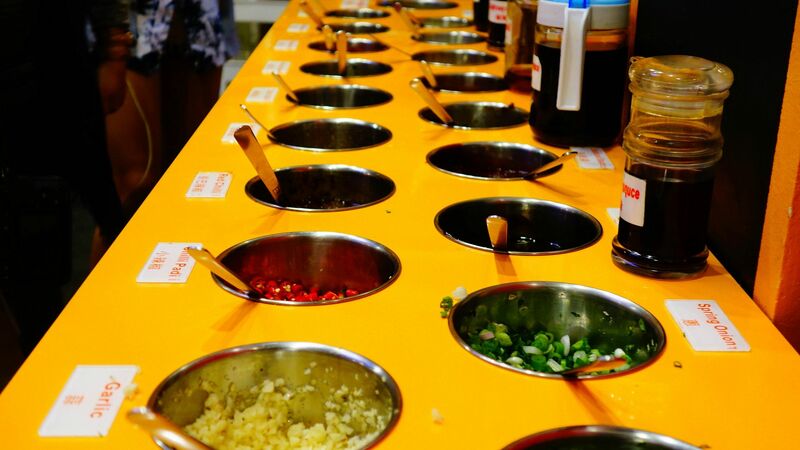 Shi Li Fang offers over 30 sauces and condiments to cater to your own style of eating steamboat. My favourites are their signature chili and peanut sauces. I was perspiring bucket loads and losing weight from having the spicy mala soup that I decided to try more items. Even though I had three glasses of lime juice and many dinner napkins, I had no regrets having the mala soup. There was definitely a difference between having steamboat at Shi Li Fang and generic steamboats, for example at Bugis. The ingredients looked and tasted of a higher quality. Definitely aligned with their commitment in serving healthier, more natural and sustainable ingredients. 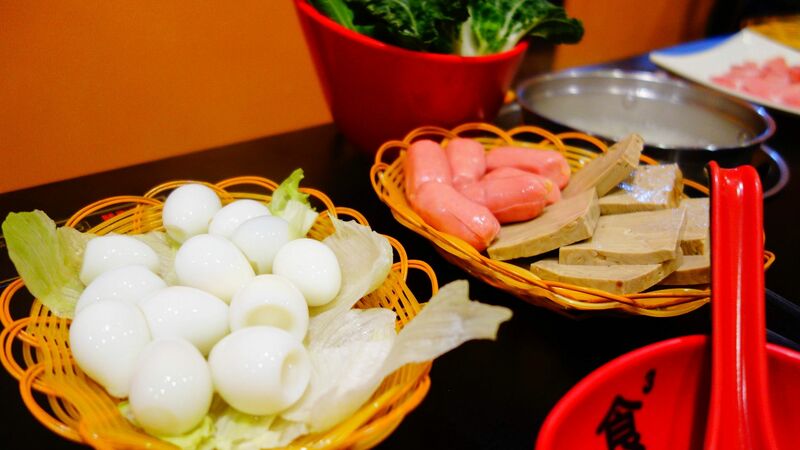 If you want a simple, quick but tasty steamboat, Shi Li Fang is an ideal choice, especially for lunch as they have sets going for $9.90! This isn’t a place you would expect personable service but at least the staff are attentive and they get the job done. However, if you intend to eat many portions or have a great time chatting with friends, may I suggest going elsewhere for a buffet option? For dessert, I headed down to Basement 2 of Orchard Central where YiLi PaoPao Ice resides. 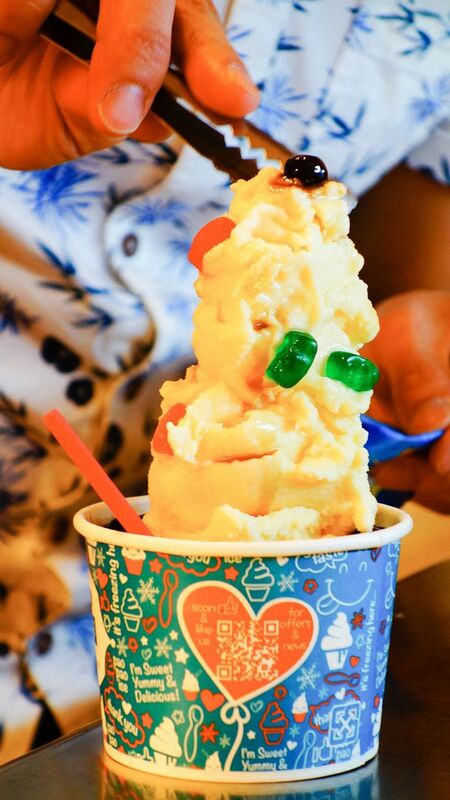 PaoPao Ice is both a modern and traditional favourite in Taiwan with an expansive history of over 60 years! When I saw the shaven ice, I could not believe my eyes. How could ice look so soft and creamy? Turns out that special blending techniques were applied to the ice and ingredients to give it that extra smooth velvety texture. 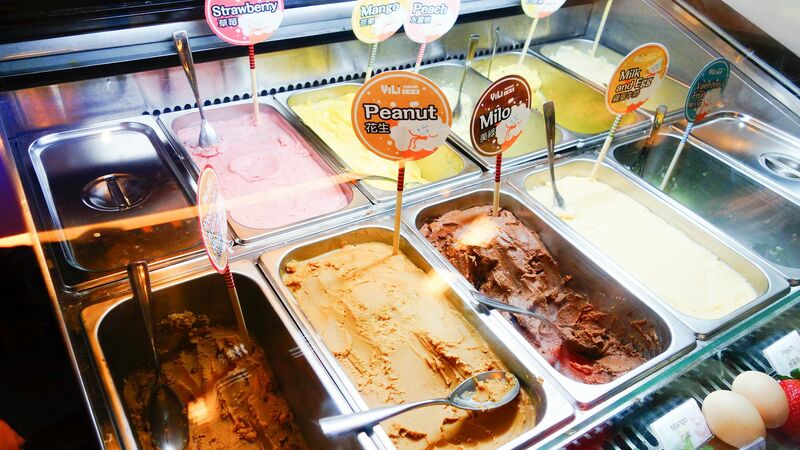 They have an assortment of flavours, which you can sample before making your choice. Whether you want something fruity and refreshing like strawberry and mango or something sweet and sinful like peanut or milo, there is something for everyone. You can get two flavours for $4.95. 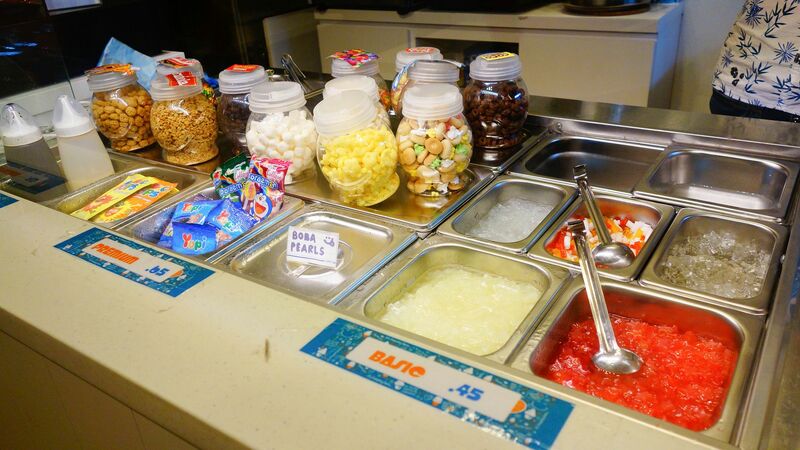 There is also an array of toppings such as jellies and confectionery ranging from $0.45-$0.95 a portion. Each cup of PaoPao Ice is handled with TLC and treated as a work of art. What a splendid way to douse the flames in my stomach from the mala soup with some yummy chilled PaoPao Ice. 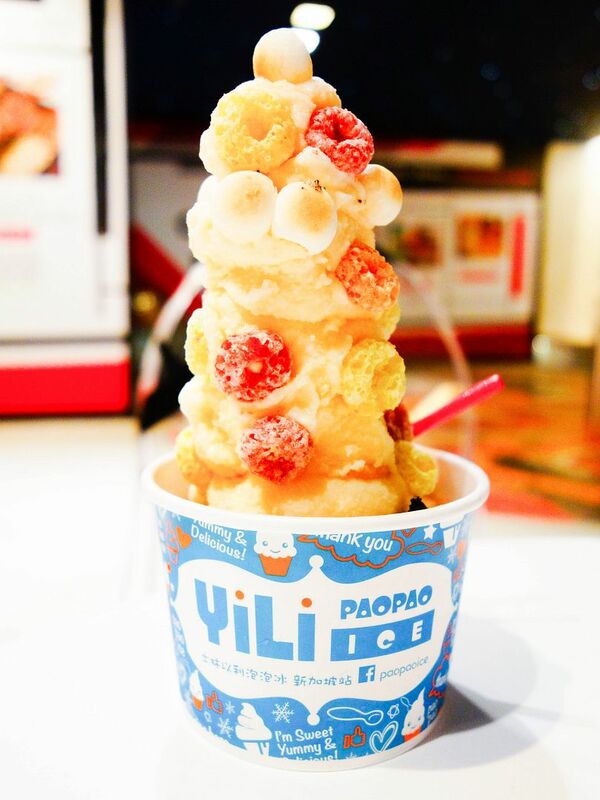 The sorbet-like dessert from YiLi PaoPao is a good alterative to the prevalent ice-cream and yogurt parlours. As you can probably tell by now, Orchard Central is one of my go-to places for a meal and especially with friends. 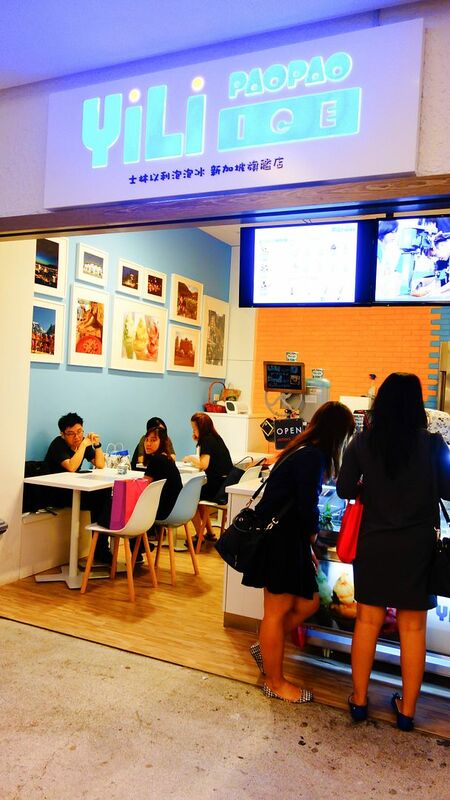 Not just that it’s conveniently located in the heart of Orchard but because there's so many food options available! There’s definitely something for everyone’s palate and budget.